Powered by a choice of 4-cylinder engines, the Mazda Mazda3 comes in sedan and hatchback bodystyles with handsome and sporty styling and excellent handling. The Mazda 3 is all-new for 2004. Bigger, more powerful, safer, and better looking than its predecessor, the Protege, the Mazda 3 offers spirited handling and performance. The sedan has a sweet, rounded shape and smooth, cohesive design. The five-door looks more aggressive and is available with a more powerful engine and bigger brakes. The 2004 Mazda Mazda3 Sedan is powered by a base 2.0-liter Inline-4 with 148 hp. Also available is a 2.3-liter Inline-4 with 160 hp. 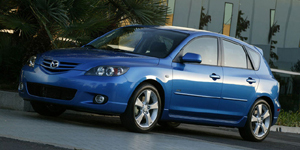 The 2004 Mazda Mazda3 Hatchback is powered by a 2.3-liter Inline-4 with 160 hp. Find the used Mazda Mazda3 of your choice from a dealer in your area. Search our used car listings now.